Off the beaten path cultural sharing experience. 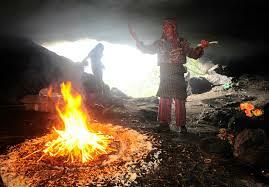 Book a personal Mayan Fire Ceremony Shamanic Cleansing-Protection-Healing. If you are interested in delving even deeper into the Mayan culture, we have a special and unique addition to any of our tours. This Mayan tradition goes back for centuries. Modern day shamans perform Personal Mayan Fire Ceremony Shamanic Cleansing-Protection-Healing as a way of maintaining their spiritual life. Mayans from many of the highland tribes travel for hours to visit holy caves and sacred sites. Mayan healers comprise a holistic indigenous healthcare practice that provides an indispensable service to the indigenous poor, who remain critically underserved by the state healthcare system. You will feel the energy and power when you participate in your own ceremony. You will feel honored to be a witness to ceremony that is a true part of the living Mayan culture of the Guatemala highlands. Our local guide can introduce you to a curandera, a traditional Mayan healer. She can lead you in a Mayan healing/protection ceremony. She is quite well known within the Mayan villages, and I am sure you would appreciate this unique opportunity to explore the healing arts of the Kachiquel Maya. In participating in your own ceremony, you will be asked to guide the intent and purpose of the ritual. You can ask for healing, protection, safe travels, cleansing of bad energy, or insight into challenges in your life. The ceremony begins with a cleansing. The priest rubs eggs on the head, arms and body of the person and then places them on top of eight piles of sugar that encircle the copal (incense balls) located at the center of the offerings. With the help of your local guide, you will learn about the 5000 year old Mayan calendar, how it relates to the ceremony, and how it figures into the daily life of the living Maya of Guatemala. You will be given your own Mayan Nawale (or horiscope), based on your birth date and year.